As I mentioned in the earlier Field Day 2010 report, the CUARC group built two antennas for the event. In this post I will describe the first one of these, an off-centre fed dipole. The common place for the feed point of the off-centre fed dipole is at a 1/3 : 2/3 split in the arms. This has the advantage of providing low SWR (with a 4:1 balun) at even harmonic frequencies, such as 20m and 10m for an antenna cut for the fundamental frequency of 40m (around 66ft). Whereas a centre-fed dipole will only have the odd harmonics which for a 40m (7MHz) dipole is 15m (21MHz). Rather than use the traditional off-centre length split of 1/3 : 2/3 for our Field Day antenna, it was decided to follow the design proposed by Richard Formato, K1POO, in two technical correspondences published in QST 1,2 and followed up with further article with by Dale Gaudier, 3. In this design the feed point is moved closer to the 1/6 point on the short arm, the advantage being stated in the articles that you should get a 200Ω feedpoint there and so a low SWR on 40m, 20m, 15m and 10m bands when using a 4:1 balun, with no need for an antenna tuner unit. The emphasis on the 15m band is intentional as a low SWR on that band is not usually possible with an off-centre fed dipole with the feed at 1/3 : 2/3 and a 4:1 balun. Four bands on one 69 foot wire antenna with no tuner looked very attractive for Field Day. The antenna was cut carefully prior to Field Day and the end insulators were added. When cutting the antenna the length measurement included the ‘pig-tail’ connections that I have on the 4:1 balun. The diagram below shows the arrangement of the antenna. On the day the antenna was installed between two trees at about 35ft off the ground. While the second antenna was being constructed (to be featured in a later post) its SWR was measured with my Autek RF-1 antenna analyzer. The results were taken by Maria, VA3MMI and Gil, VE3JRY and are tabulated below. The overall results were very pleasing, although the 40m band was a little disappointing. This higher than expected SWR on 40m was also encountered by Dale, M0AOP/K4DG, and was reported 3 by him to be due to the severe imbalance in the antenna, so requiring a choke balun to remove the stray RF on the coax. We did not try a choke balun, since we were unlikely to operate on 40m, that was another station’s band of operation. However we had an antenna tuner unit if we needed to try and tame the SWR. It was very good to see the SWR profile observed in reference 3 was repeatable. On Sunday morning Maria, VA3MMI, returned with a portable analyzer borrowed from work and did a sweep analysis. The response is below and markers have been inserted to show the minimum SWR associated with the bands. Thanks goes to Maria for the measurement and the plot. Off-centre fed dipole SWR plot, with markers. It would be interesting to remeasure the SWR response again with a choke balun in place. I expect the SWR will drop below 2:1 within the 40m band as found by the author of reference 3. If this does happen then four bands and no tuner needed makes this antenna one for serious consideration on HF. 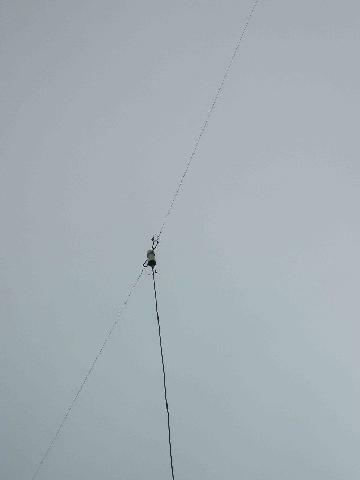 Even without a low SWR on 40m the antenna offers three bands and it performed well on 15m and 10m for us on Field Day. As a final note, I should reiterate the warning by Dean Straw, N6BV, at the end of reference 1 where he warns about using the antenna on 30m, 17m or 24m, as a very high SWR could damage the balun at the feedpoint. 1. “Improved Feed for the Off-Centre-Fed Dipole” R. A. Formato, K1POO, Technical Correspondance, QST, May 1996 p76. 2. “Off-Centre-Fed Dipole Comments, Part 2”, R. A. Formato, K1POO, Technical Correspondance, QST, October 1996 pp72-73. 3. “Choke the OCFD” D Gaudier, M0AOP/K4DG, Technical Correspondance, QST, September 1997, pp82-83. Note: all three of the above papers are collected together in “More Wire Antenna Classics Volume 2” ARRL, (1999). The Field Day photographs above are from the Ottawa Valley Mobile Radio Club’s photo gallery. Excellent article as usual Alan and good that the students are constructing some very capable antennas. The other antenna was an experiment and that performed well too. Details on that antenna will follow. As always, a very interesting read providing much food for thought. I have limited space in my backyard for antennas; verticals are not really a problem with wire antennas are as I have barely enough room for a full size 40 meter dipole. While fussing over just what to do I thought I would give a 40 meter Windom (the more traditional off center fed antenna design) and have been very please with it’s operation. It gives me 40, 20, and 10 and I have even used it on 15 a couple of times even at approximately a 4:1 swr. I use an old TS-520 and it tunes up and doesn’t complain but my biggest concern of course is the damaging the 4:1 balun at that high a swr. I like the antenna so much that I will likely put together a lightweight version for portable use. As my favourite bands are 40 and 20 the more traditional off center feed dipole is a better choice for me but you comments on this variation of the antenna has sent me off in search of more reference material. I have often wondered what you would get if you put a 40 and 20 (or 40 and 15 or 40 and 10) handstick type antennas together in a dipole like configuration. A two band dipole or multi band? Something I have on my “give a try” list – unless I stumble over the results of someone else’s experiment. Glad you find the post interesting. If you are thinking of an off-centre fed dipole for portable work, take a look at Bill Wright’s, G0FAH, “Four Bands, Off Center”, QST, Feb. 1996, p65. He used a traditional 1/3:2/3 cut but fed it with ladder line. He used a length of ladder line that was an odd multiple of 15m 1/4 wavelengths, so that this would convert the high feedpoint impedance to a low one on 15m. Then at the end of the feed line he used a 4:1 balun for 40m, 20m and 10m and switched to a 1:1 balun for 15m. If you can get some 300 ohm TV twinfeed for the feed and two small baluns (perhaps homebrew some QRP ones) you may have a light-weight version. When portable the baluns can be close by for easy switching. If you find the hamstick dipole information, or experiment yourself, let us know the results here. Thanks for a great article on the OCF Dipole. I have just finished building a 4:1 balun and dipole and can not wait to test it and see the results. The antenna has some outstanding reviews( from around the world )for such a simple construction. I (and I am sure others) would be interested in hearing how your antenna testing goes. Feel free to give an update here via a comment. All the best with the construction and testing. Just discovered your super FB Blog today, and boy it’s amazing to read all kind of interesting news and many experiments especially antennas. I have limited space in my back yard and I love wire antenna, Here I have a 32 ft home made flagpole mast built of aluminium, except for the base support which is of heavy steel, and burried 4 ft in a small concrete base. I can raise and lower my mast with the help of a small hand winch. With this I can experiment many kinds of antennas, so next spring will sure try this off center fed , as I want 15 meters too, and with other OCF designs it’s not possible. Thank you for the nice comments about the blog. The off-centre fed dipole is still being used. It is the main HF antenna for the Carleton University Amateur Radio Club and it is mounted on top of the Engineering building at Carleton. Works well and recently was used in a QSO with a Japanese station. Keep returning to check the updates. It has been a while since I posted as I have been busy with work. You are correct about Canada too, so much to see. This looks very similar to w8ji’s work on an 137′ (80m) 80%/20% OCF antenna. 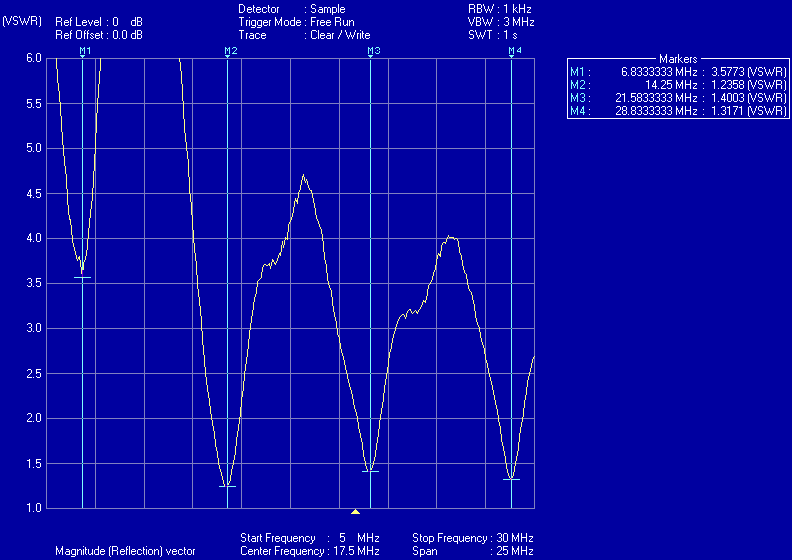 He found his resonant at 2:1 SWR or better on 8 bands. I would be very interested to see if the imbalance in this antenna could be encouraged with a voltage rather than current balun and used to drive a vertical radiator element like in the “new carolina” OCF’s. Resonant on 8 bands and a better take off angle on at least some of them is a very attractive proposition.